A companion article at TopOc discusses the importance of correct documentation and an unexpected observation I made while crunching numbers for this research. The first feature-length report from the ArkFab Collective is now out as a downloadable booklet! 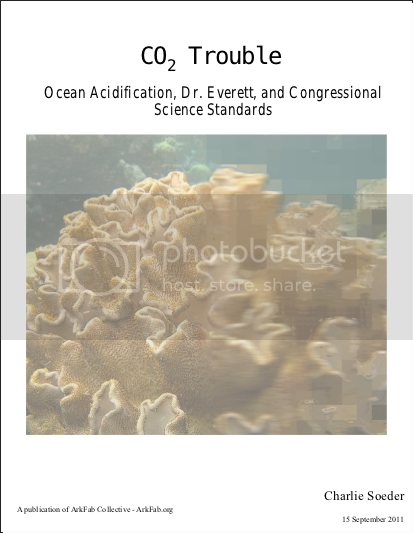 "CO2 Trouble: Ocean Acidification, Dr. Everett, and Congressional Science Standards" is available for download and sharing HERE. As I have written in previous posts, environmental issues are downplayed in the political sphere with scientifically questionable but mediafuzzy talking points. I found this to be the case with Dr. Everett's 2010 congressional testimony arguing that 'there is not aproblem with increased acidification'. I have been writing about my research on the subject at TopOc; CO2 Trouble is the final report of my findings. It has been designed to be a fairly short (less than 30 pages, including images, appendicies, etc.) and accessible read. Suffice to say, Dr. Everett's testimony doesn't stand up to scientific scrutiny. Public policy makers increasingly rely on the research of think tank scholars to guide their policy decisions. But who checks the accuracy of think tank scholar research? Unlike academic journal publishing, which follows a rigorous system of peer review and editorial oversight, think tanks publish opinion pieces without regard to the peer review process. Their policy publications are based not on pure academics, but on a complex interaction between academic, political, and economic interests. In Washington, there is no time to focus on the academic details. Koski wrote that in 2007; in the years since, the think tanks have become even more crass in their tactics and have been joined by their DIY equivalent, Blog Science. On the other hand, my experiences in trying to gather informal and community-based peer review left me hopeful for the future of democratic science networking. There are resources like ResearchBlogging for connecting science bloggers, where much of this report was field-tested. I am already experimenting with using ResearchBlogging to present original research. I also found that the experts I contacted with my questions were helpful and encouraging. Online communities have provided a forum for a lot of great discussions! One final observation is about this networking of individual scientists, a prerequisite for science generally but for DIY and citizen science as well. Antiscience can sometimes have the effect of impeding research, as when a lab is flooded with nontrivial FOIA requests. I brushed against a bit of its erosive influence in the writing of this report: more than once, I had correspondence delayed because I was mistaken for a climate 'skeptic'!